Australia, 2002, 95 minutes. Colour. Nathan Phillips, Luke Carroll, Lisa Flanagan, Tom Budge, Simon Westaway, Celia Ireland, Kevin Harrington, Martin Vaughan, Max Fairchild. 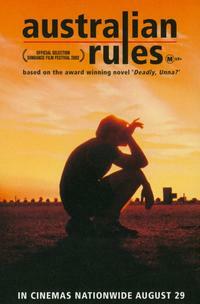 Australian Rules was strong film of 2002, amid several films on that regional theme released that year. These included Rabbit- Proof Fence, The Tracker, Beyond Clouds, Black and White. This film is set on a coastal town in South Australia, fairly remote, with a community of whites as well as a mission for blacks. What brings them together is Australian Rules football – especially as, this year, there is a possibility of their winning the premiership. The football story is a hook to get audiences interested in the more social issues and the justice issues. The film focuses on Nathan Phillips as a teenager who plays football but is interested in improving his education. Luke Carroll plays his best friend, an Aboriginal boy from the mission who is a star footballer with prospects of going further. Lisa Flanagan portrays his sister who plays an important role in the young white teenager’s life. Simon Westaway is his brutal and prejudiced father. Celia Ireland gives a very strong performance as his mother, suffering under the brutality of her husband, yet enthusiastic with her five children, and especially with her advice for playing Australian Rules. Kevin Harrington portrays the local coach, he is also the local butcher. Martin Vaughan is an old man who prepares worms for bait. Max Fairchild is the pub owner. The film is well acted, well written, gives an interesting portrait of life in such a town, frightening in the portrayal of the underlying, sometimes unconscious, racial prejudice and superiority by the white community. The film builds up to a double climax, the rejection of the Aboriginal boy as the fairest player on the field and his becoming involved in a robbery which leads to his death. The film offers a great deal to reflect on in the Australian context. It was directed by Paul Goldman who went on to make The Night We Called It A Day as well as Suburban Mayhem. 1. Contemporary issues? The past, the present, South Australia, Australia and aboriginal issues? 2. The portrayal of the town, small, coastal, the sea and the beach, the shops, pubs, the football field, hopes? Capturing the atmosphere? The musical score? 3. The title, the focus on football, its popularity? The ambiguity of the title – Australian racism rules? 4. The film offering a critique of Australian attitudes through drama, characters, conflicts, prejudice and violence? 5. The focus on Gary, his ironic nickname Blacky? His age, his place in the family, his dominating father, his kind mother, the rivalry with his older brother, the young girls? His skill as a footballer? Small build? Yet wanting to improve his vocabulary, in the toilet reading the book, the improvement book? His friendship with Dumby? His friendship with Dumby’s sister? With the team, the coach and his carry-on? Joking? The arrest of the tall footballer for robbery? His having to go into the ruck? The coach and his advice? His mother and her tactics at the meal table, her advice on the day? His playing, changing the tactic? The accident and the winning of the trophy? His award? His life in the town, prospects, his father making him dive, his refusal to work? The critique of his father? Dumby and his friendship, Dumby’s death, his grief, standing up to his father? Talking with Dumby’s sister? The night of the awards, at home, the sexual encounter? His staying with the coach’s son? With Pickles? His dressing to go to the funeral, the confrontation, Dumby’s sister letting him come, his grief at the coffin? His future? Leaving town, Dumby’s sister? A symbol of hopeful white attitudes? 6. Dumby, his age, his skill in playing, his future in the game? His friendship with Blacky, their scenes together, talking, playing? Dumby’s personality, his relationship with his family, his sister at the play, the father and the family? The elder and his criticisms? At the awards? Accusations of racism? His playing in the championship, the taking of the mark, his passing to his friend, his expectations of winning the medal, not winning? Hurt? Participation in the robbery? His being shot? The pathos of his funeral, Blacky going to the funeral? 7. Arks and his harangues, in the locker room, yet his praise of his team, his hopes, relying on his son? His son’s arrogance? With Dumby? His wanting the Aborigines in the team? Yet his prejudices? 8. The bar, the drinking, the bigotry? The boss, giving Dumby a drink? The coach? Blacky’s father and his talking? 9. Blacky and the background story, his father and the pub, genial, his father not at home? The kids? Bashing his wife? The kids hiding? The mother and her support of Blacky? Her eagerness at the meal, her advice? Setting up the condiments to illustrate play? Giving him encouragement at the championship match? A good woman? 10. Blacky’s brother, the gibes, yet the support? The girls, being protected from their father? 11. Dumby’s sister, her friendship, talking with Blacky? Flirting? Under the pier, on the beach? Going home, the sexual encounter? Blacky’s family seeing them, the family reaction? The funeral? Her allowing Blacky to come in? Moving away from the town? A future with Blacky or not? 12. The surly black leader, his speeches? Heckling at the awards ceremony? Participation in the robbery? The cause of Dumby’s death? 13. The mission, the attitude of the blacks towards the whites in the town? Vice-versa? The Aborigines as players? Their way of life, the way they were treated? Turning up late but yet playing in the championship? The insults? The feeling at the funeral? 14. The theme of football as a way in to explore themes of racism in Australia? The history of Aboriginal players in the Australian Football League? Their status in 2002 when the film was released?